A very versatile ride with a very clear ping and a warm, very lively sound. Strong bell, wide frequency spectrum: The Ride is especially suitable for low to medium volume. 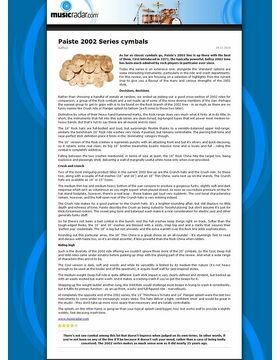 When it comes to cymbal making, Paiste are at the very forefront of making quality cymbals with a distinct sound that's their trademark. 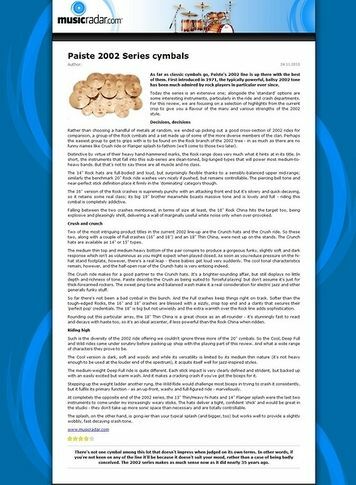 They can be heard on countless Rock recordings over the decades and had their most famous Rock endorsee, the legendary John Bonham played their 2002 series cymbals from 1970 onwards. 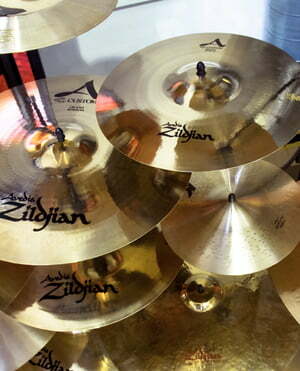 Being a fan of Bonham led me to purchase a cymbal from the 2002 series, a 20" Classic Ride. Bonham played a massive 24" 2002 Ride but i have a fusion kit and was after that similar quality sound heard on many Led Zep recordings. 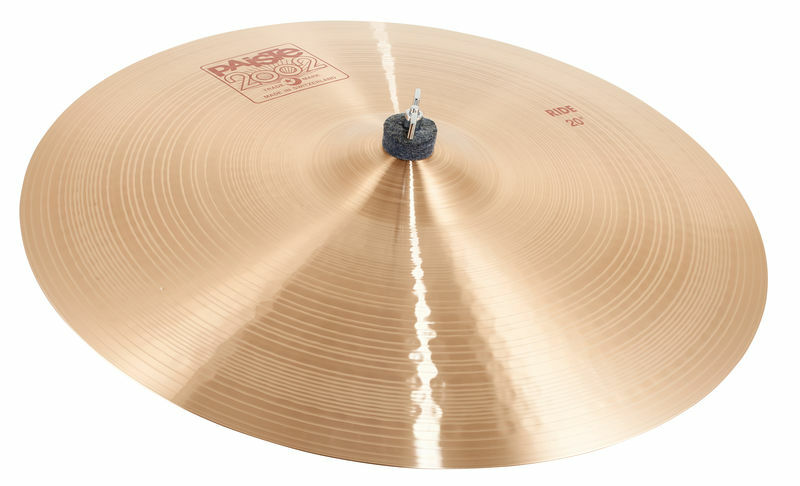 The sound and tone of the cymbal is very pleasing to the ear, it is warm, washy and shimmering and has a loud + clear bell. 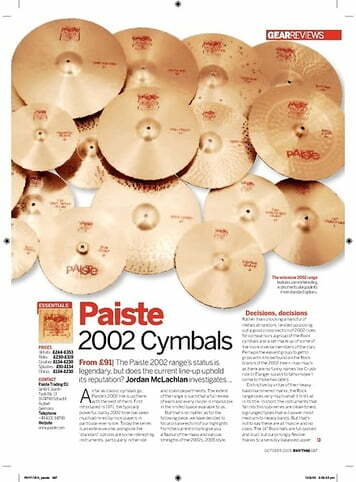 This is no doubt down to the Hand-Hammering and Lathing that gives Paiste cymbals their Classic sound. Stick definition is clear + pingy and the cymbal has a dark undertone, depending on what part of the cymbal you play + at what force you strike it. I'm very pleased with the purchase for its overall Sound, Tone And Quality and will hopefully be using it on many recordings and rehearsal for years to come! I tried this Ride the first time in a store, and I cracked for the finesse of the sound. This is paradoxical, because I play mainly big rock. And precisely, unlike some Ride, when pounded along a riff, the sound is gradually amplified, which prevents it "squirts" and passes before all other instruments systematically. It also knows how to be very precise when it is simply caressed, and these harmonics are very pleasant. 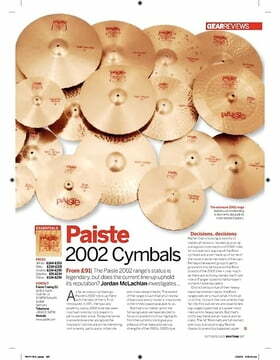 Side robust, no complaints, you are in the high-end Paiste, I own it for 3 years, and not a single sign of fatigue. The only slight criticism I can make is that the bell has difficulty to stand out from the rest of the cymbal sound, except that you can buy it with your eyes closed.